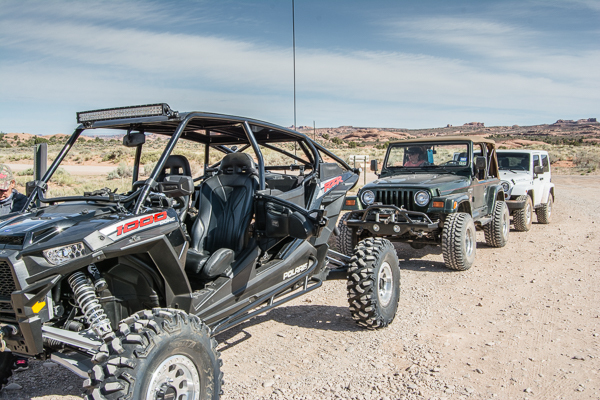 The plan is to introduce the Rubicon to slick rock off-roading at Sand Flats Recreation Area while simultaneously sharing with George and Michele this challenging treat. 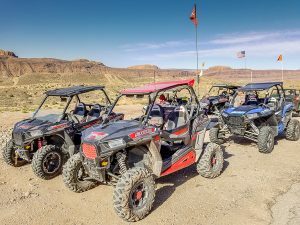 As a long line of side by sides headed by Jim leads us out of the RV park through town to Sand Flats, the bright sun and warming temps promise a fun day of rock crawling. After threading the vehicle line past the toll booth at the entry, we regroup at the trail head to begin our ride through Fins and Things. The side by sides race forward and fade from our view, but for about a mile or so the Rubicon playfully crawls up and over rocks and splashes through the dry washes between obstacles as the four of us in Jeeps enjoy a slower but equally thrilling pace. Suddenly the gentle purr of George’s engine is replaced by the unfulfilled growl of a winding starter. 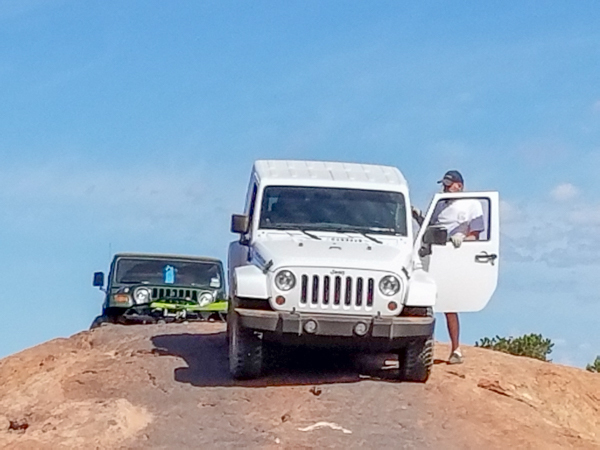 Yes at the top of the steepest drop so far, George’s Jeep stalls out. No amount of coaxing will convince the engine to convert fuel to energy and proceed down the trail. Concerned that we are blocking the path, he releases the brakes and coasts over the obstacle. We follow him down and now we are all down in a ravine trying to breath life into George’s unresponsive jeep. OK we know it has gas, but the engine appears to be fuel deprived. Weirdly the fuel gauge reports empty as well, but again we can see that the tank is almost full. The consensus is that the fuel pump chose this location to turn belly up. With no tools, parts or good place to work, the guys decide we will have to pull it back out of the trial. Easier to retrace our tire tracks so far than to go forward toward the far, far away end of the trail in front of us. Now all we have to do is turn the disabled Jeep around then haul it back up the huge rock it earlier descended. I apologize for the lack of photographic evidence of this feat, but Michele and I are devoted to walking the trail ahead of the twosome to warn oncoming riders of our backward progression and to accept their condolences, empathy and helpful suggestions. Even from my distant position on the trail in front of the Rubicon, I can see from the barely suppressed grin on Storm’s face that this is an unanticipated level of fun that he is thrilled to accept. Instead of merely bragging that the Rubicon tackled Fins and Things on its first run, he can now boasts of its ability to rock crawl with another Jeep in tow. As Storm tops the first obstacle with George’s Jeep dangling on the tow rope behind, I hear one of the friendly guys who stopped to assist us say, “Wow, I never thought I’d see a stock Rubicon do that!” OMG – is that caveman grunting I hear echoing out of the Rubicon?? After a safe, slow tow back to camp, Storm and George diagnose the problem as broken wires to the fuel pump. That is a LOT easier to fix than a dead fuel pump and after a little soldering and re-connection, the Jeep engine roars back to life. After the adrenaline rush of the breakdown and the walk out of the trail, I on the other hand am ready for a nap! I can tell you that riding Fins ‘N Things without Terrie is just not the same. She adds a level of excitement that just can’t be duplicated without her! Give her a hug for me, please! Accept the challenges so that you may feel the exhilaration of victory.